First up, this one spotted in Brisbane. The bird they were talking about is below. Next up, this sign at the Hard Coffee cafe on Queen Street in Brisbane, where we had lunch a couple of days. Beware of wildlife! Penguins Crossing in Scorching Bay, kereru by Zealandia and ducks in Karori. Moving to the Northern Hemisphere, but sticking with wildlife, this sign seen in Stonehaven, near Aberdeen, Scotland. Next up, this sign from the market in Noumea, New Caledonia. Hoping to get back there later this year. Finally, one for Wellingtonians that might appreciate! Courtney Place is full of bars and…well, some of us might prefer Poquito on a Saturday night! Sign at the top of the post….have you ever felt that way? 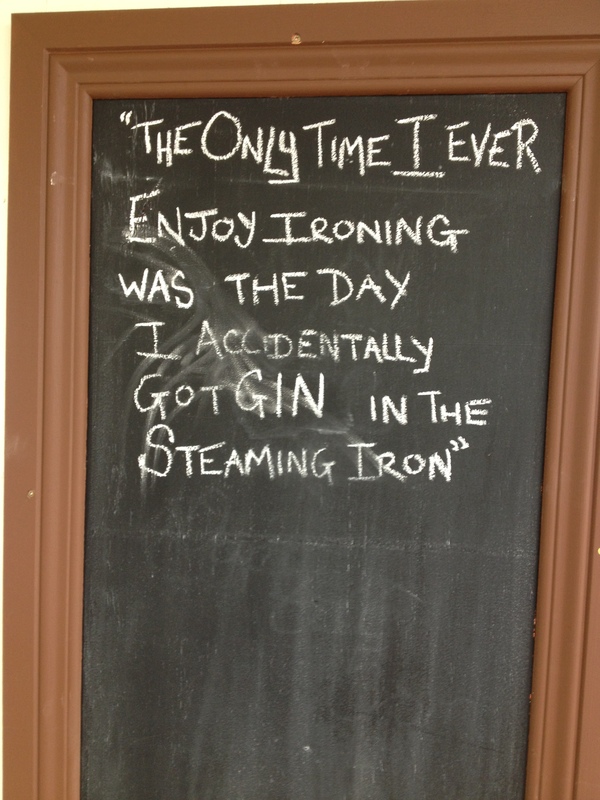 Great signs – must really try the gin in the iron thing! Wow imagine eating off the table the stars performed on! That’s really cool. Yes I liked the fact that the table had been made out of an old stage too! And as for the gin….. I dont think anyone would purposely enjoy ironing, in fact we don’t even own one.